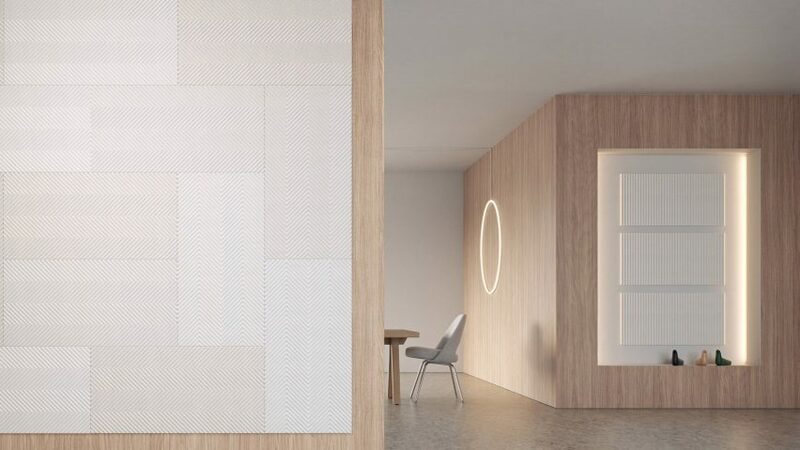 Acoustic products brand Baux has worked with a team of scientists specialising in biomimicry to create a line of biodegradable acoustic panels, called Baux Acoustic Pulp. Made from a new paper-like, plant-based material, the series of nine panels was developed with Swedish industrial design studio Form Us With Love, in collaboration with scientists from the Royal Institute of Technology (KTH). The new chemical-free pulp material is based on over 25 years of research and formed of organically modified cellulosic fibres taken from sustainably harvested Swedish pine and fir trees. The wood is first broken down into a liquid cellulose form before this pulp is dried out, in a process similar to making paper. The wood fibres are then modified to mimic the natural protective properties of various plants such as the fire-retardancy properties of grass roots, the water-repellency of lotus flowers, or the strength of the catalytic combination of potatoes, plant wax and citrus fruits. Working with the manufacturer, the team initially experimented with mixing in shrimp shells, but these didn't prove strong enough and they were unable to locate a sustainable supply chain for this ingredient. Launched during this week's Stockholm Design Week, which runs until 10 February, the panels feature one of three patterns that are cut using advanced laser-cutting technology. The panel with straight indented lines is called Sense, whilst Pulse and Energy both have zig-zagged surfaces. The laser-cut patterns form nano-perforated surfaces inspired by origami paper-folding techniques that allow sound waves to enter the panels and get trapped in the honeycomb chambers on the back. The technology, which was once reserved for aircraft and spaceships, keeps material usage to a minimum and means that no waste or pollution is created during the production process. Instead of paint, the acoustic pulp is coloured with non-genetically modified wheat bran resulting in a palette of restful neutral colours. The panels are available in three slightly varying colours that are created by incorporating 30 per cent or five per cent wheat bran, or no bran at all into the pulp. Next the brand will look into using natural dyes from lingonberries, blueberries and beetroot, or mineral to colour the product. The team imagines that they will be used for sound-proofing and decoration in communal environments like offices, restaurants, schools and boardrooms. "In the face of climate change, environmental pollution, and excessive consumerism, we as an industry can no longer afford to ignore the part we play," commented Baux CEO Fredrik Franzon. "Designing and prototyping for the future is not enough. We need to create a sustainable future today. The Acoustic Pulp sound absorbing panel is the result of our deep commitment to this vision." Founded in 2014, Baux is a joint venture by entrepreneurs Johan Ronnestam, Fredrik Franzon, and the founding members of the design studio Form Us With Love, Jonas Pettersson, John Löfgren, and Petrus Palmér. The founding concept was to take conventional architectural products and make them more visually appealing. Its inaugural product was a type of acoustic panel called wood wool made from spruce wood, cement and water. Since then, the brand has gone on to produce the wood wool tiles in various different colours, shapes and finishes. In 2017 it released a pattern library of 500 downloadable panel and tile designs for architects and designers.